We have a fig tree down the back of the yard in our (rented) house. It looks like two trees but they are probably joined underground. Last year was the first time I really had cause to watch the genesis of figs up close. I couldn’t quite account for it. It seemed as though there was a fruit without any antecedent flower. Now I know that the fig starts off as something like an inside-out flower – the sexual parts are all inside. Apparently sexual reproduction of figs depends on symbiotic species of wasp specific to each species of fig: in New Zealand it was many years after the importation of Australian species fig cuttings that the relevant wasp caught up. It gets more complicated than that: some figs have male and female plants; vegans apparently fret over the fate of the wasp which goes in to lay its eggs and apparently dies in there. But I digress. Birds started taking the odd fig off the tree. 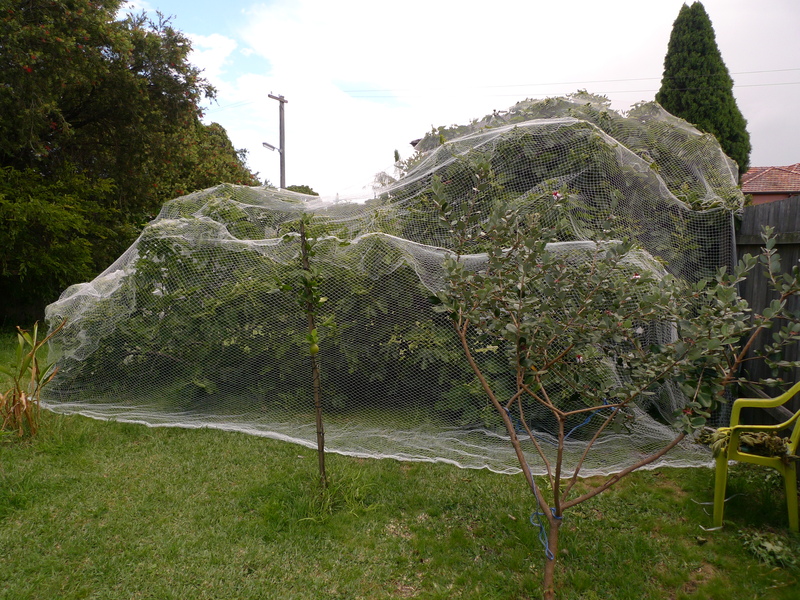 All of a sudden we noticed nets on other people’s trees. Walking around Ashfield we saw one particularly well-netted set of trees, but we were deterred from asking the older (my guess: Italian) gentlemen tending the crop-filled garden by his fierce mien and the sling-shot in his hand. That man, we thought, is obsessed! In the end we got some nets, but not enough for the size of the tree. Having just moved house, we were reluctant to buy even more. D wanted to prune the tree to bring it within our netting, but I remonstrated with him. He did his best to wrap things up. By then, currawongs were hanging round from about 8 to 9 o’clock each morning. One bird got trapped in the netting. D set it free. It still seemed as though there would be enough for all of us. I tasted the odd just or nearly ripe fig. Then one morning the currawongs totally cleaned us out. There must have been 10 of them. Mostly they had just hopped along the fence at one end and come in at a gap in the net at that end of the tree/s. I saw some of them doing it. 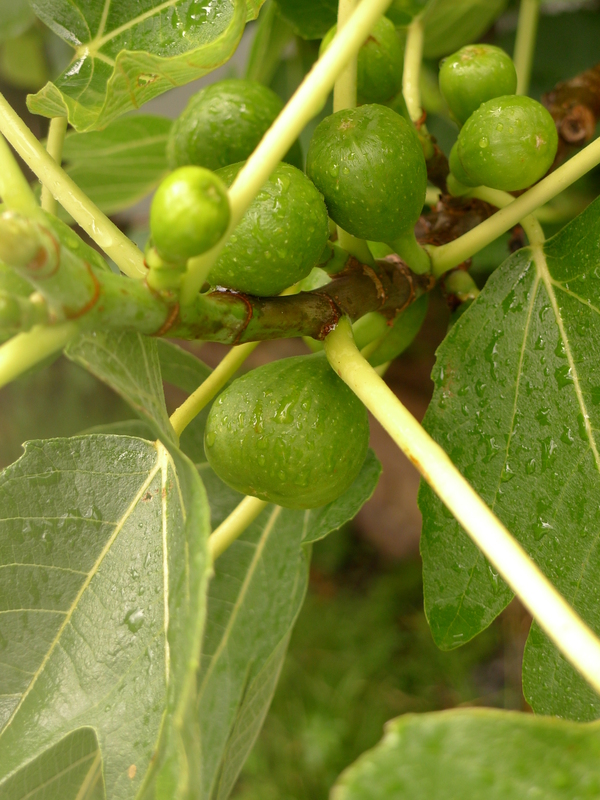 This year the first crop of figs appeared on the old growth. They seemed few. Then, perhaps in answer to my fertilizing nudges, a second crop appeared on the new growth. D, who had been in China since July, returned on the ides of November. I told D I hadn’t seen any currawongs around yet. Trees we had spotted with nets last year still lacked them. It was too early to worry: the figs are far from ripe. D pointed out some half-eaten figs on the ground and the odd missing fig from our tree. D swung into action. D pruned the tree some more. I held the ladder. He has extended the legs of the ladder with pieces of wood secured with industrial-grade sticky tape. Did I mention D comes from China? He was raised to be practical and resourceful, if sometimes a little alarmingly (the sticky-taped clear plastic tubing to take the gas to a relocated stove in an earlier flat comes to mind). With the help of a long pole with a hook on the end made from part of a wire coat hanger, we got the different pieces of netting over the top of the tree/s and joined together. Now we were obsessed, especially D.
The netting still wasn’t enough. We drove to B__ings for netting. On the way we passed the garden of the fierce old Italian. His nets were up. The spot adjoining the fence still had a gap which I thought might still get hopped through, but our obsession had subsided a little by then. That was Sunday, On Monday morning I looked back from the house. 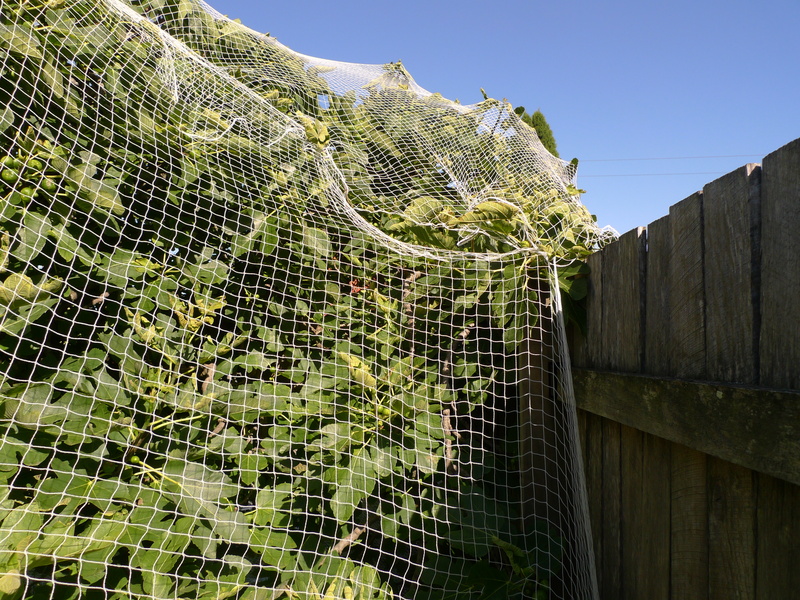 The gap in the netting by the fence had widened considerably. Closer up, I could see and hear a bird frantically and unsuccessfully trying to fly up through the top the the netting. Going closer still, I realised there were two birds. The the less frantic was a large black bird with a red eye. That is the male koel, long heard but only seen by me for the first time this year as it has called from the neighbouring jacaranda and taken an interest in the last of the mulberries. The frantic one, with a specked back and a banded front, I knew to be a female. I hadn’t actually seen one before – maybe it was more reclusive and hence more distressed. We opened up the net. We banged on the net with the pole to drive them to the opening. Once they found the gap they were out like a shot. People complain about the male bird’s constant call but I quite like it: it doesn’t keep me awake and it is lively and exotic. We wrapped the tree up again. Christo was here! I also saw a pair of channel-billed cuckoos being chased away by magpies a few weeks ago. What was odd was that the magpies left alone another CBC which remained quietly perched within a big tree as the other/s were chased off. At the time I wondered if this was a juvenile which was still “undercover;” on subsequent reading up I see it could have been a female waiting to pop an egg in – though this would mean that I only saw one being chased away, which is not my recollection. There is something fascinating about brood parasites. Is it a “hiss the villain” thing? The koels weren’t there on Tuesday. We hope they have been put off. I saw the male around again on Thursday though he steered well clear of the fig tree. I spotted the first currawong hanging around on Friday. I used to like currawongs but I find my attitude to them quite altered. I put my postcode into the ABC’s Local News site. I wanted to find out more about a cyclist killed in a collision with a truck. Before I tracked that story down, I read that a man was bashed and stabbed at about 9.30pm last night in Ashfield Park. According to the report, he walked to a “nearby railway station” (I wouldn’t have said any station is particularly nearby, though two are within walking distance) and rang a family member. At this point the man noticed a small cut on his leg. News is in that “Father” Kevin Lee, a laicized [Roman] Catholic priest and sometime parish priest of Glenmore Park, in the west of Sydney, has died in the Philippines. I know I am not the only one to wonder that he should have chosen (if the report is true) to go for a swim when one of the most powerful typhoons ever was expected. Lee leapt into the headlines in the last few years of his life. When he disclosed that he had been married for a year after falling in love with his bride-to-be at a karaoke bar in the Philippines when he was leading a pilgrimage there (it turns out in passing that priests get to go on a surprising number of such “pilgrimage” trips), he was dismissed from his parish post. He self-published a book, UnHoly Silence, about the church’s response to sexual abuse allegations, on the strength of which he seems now to be identified (approvingly) by some as one of those who brought the present Royal Commission on. I had missed most of that, but I did read a sizeable slab of his book. It struck me that Lee had more than a bit of the Derryn Hinches. He could certainly strike out at the (many) people who had been wrong when he was right. A sometime police chaplain, he often read like a clerical (or ex-clerical) Tim Priest – and then he fell out with his police chum (not Priest). Lee saw nothing odd about putting up Liberal Party billboards in church grounds (and writing partisan commentary in the local press) when he was still a priest, contemplating joining that party and seeking preselection. (This was ultimately unsuccessful: he denounced them all.) And he definitely had a special circle reserved for homosexuals or people he took to be homosexual. Under the weasel-words of “people are saying” he claimed that one fellow priest was running a foundation which gave grants to up-and-coming artists and musicians and other performers as a means of enriching himself and procuring sexual favours from would-be recipients. Admittedly, the priest in question is fat and queeny and with a distinct taste for the high-life, but the sexual allegation is scandalous and implausible but for Lee’s attitude towards “the gays” – certainly, the basis Lee gave for it is paper-thin. It’s hard to take the accusation of self-enrichment any more seriously. All of that comes from the 10,000-odd-word excerpt I have linked to, and much more besides. I doubt if Father [F&Q, see above] will spare many tears on Lee’s passing. There is a lot of Lee left behind on the internet, mostly from his last couple of years. Despite his laicization, he still said he considered himself a priest and published quasi-homilies. He was living in the Philippines with his wife, Josefina, who recently bore their child. He’d obviously left any clerical comfort-zone well behind. To me it seems Lee was a bit out of control; certainly he was a bit wild. Maybe that explains, or is of a piece with, the strange decision (if it really was a decision – but how could it have been a mere mistake?) to go swimming at such a dangerous time. In Australia, our new government sedulously dissuades us from any environmental effort, particularly when it comes to global warming, by the contrary example of the Chinese. I first went to China in 1998. Since then, I have noticed some “environmental” developments. Public rubbish bins now routinely have a “recyclable” and “non-recyclable” receptacle. True, this distinction is almost universally ignored, but to the extent that it is observed it may make things just a little easier for the free-lancers who go from bin to bin retrieving the recyclable objects (especially plastic water bottles) and putting them into enormous sacks on their bicycles. Styrofoam takeaway food containers and chopsticks used to gather in practically every windbreak of any sort in any public place. I can’t work out how but you don’t seem to see them or at least so many. In urban areas, at least, the motor bike has been supplanted by the electric bicycle (though electric bicycles have probable replaced quite a lot of ordinary bicycles as well). And you now have to pay for a plastic bag at the Supermarket (a measure also adopted in Australia in the ACT though not yet in NSW). You can buy a slightly more robust one than they used to give away. 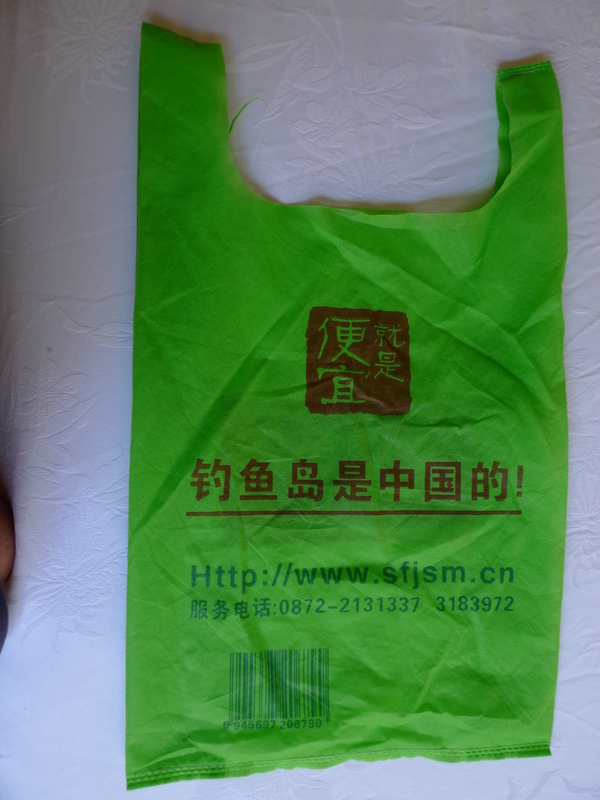 It doesn’t cost much, but the Chinese are a frugal people. Unarmed with my own bag I went shopping this year on the main street of Dali old town(Sifangjie, a common name for a main street in these parts). 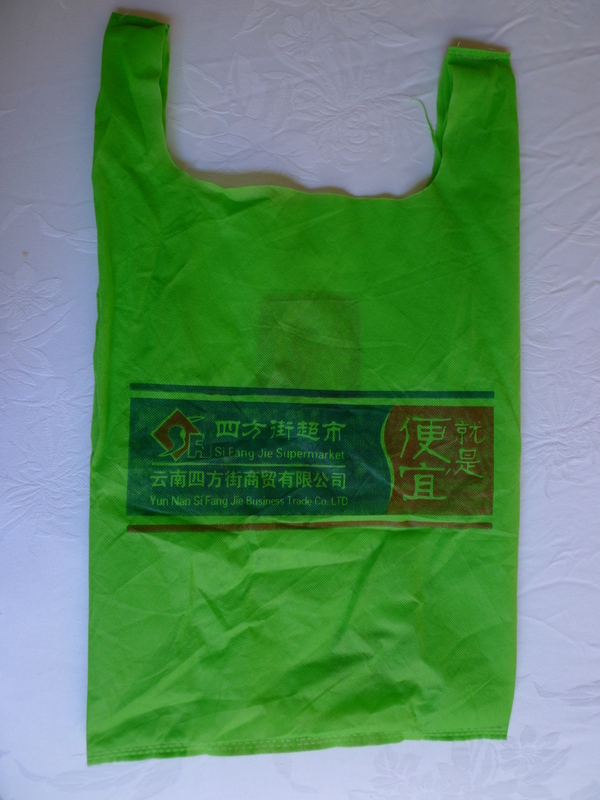 I have kept the bag I bought as a souvenir. 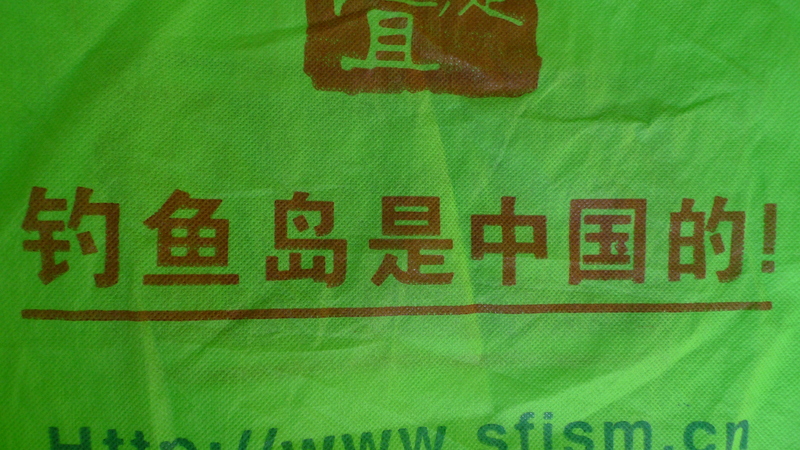 The bag identifies the shop and its slogan, reproduced at the head of this post, which places an appropriate (especially for China) emphasis on its goods being well-priced. That’s right: 钓鱼岛 – that’s the Diaoyu Islands (to the Chinese, Senkaku to the Japanese) – are Chinese! Those are the islands which are currently the focus of heightened feelings between Japan and China. 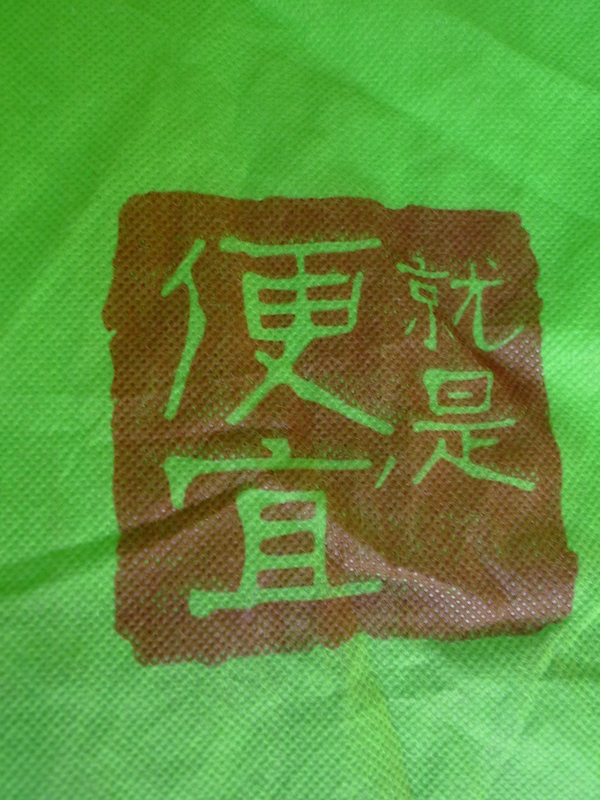 I’d be surprised if Japanese supermarket bags are festooned with equivalent slogans. You are currently browsing the Stumbling on melons blog archives for November, 2013.